Bake a cake using a teddy bear cake pan. After the cake has cooled, cut half of the ears off of the bear cake. 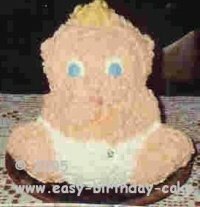 Put a diaper on the baby using white icing and star tip #18. Using the same star tip size #18 for the whole cake, do the eyes next using white and blue or brown icing. Cover the remaining of the cake with light pink icing. Put little whisps of hair on with the same size star tip #18 using yellow icing or black, brown or red, whatever color you choose. This cake is a great cake for baby showers. You can also put blue or pink safety pins on the diaper if you know if the baby is going to be a boy or girl!